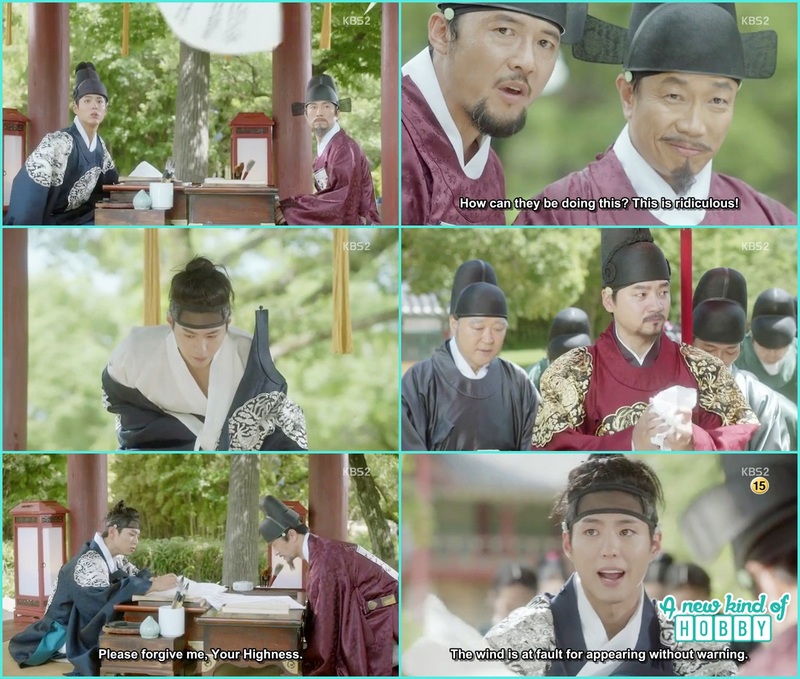 After a very long time we happen to watch a historical series Love in the moonlight starting Park Bo Gum as the crown prince and Kim You Jung as Ra On a disguise of a young boy who counsel men on dating. It was an interesting plot previously we had seen many dramas but it sounds a bit different and also remind us of Sunkungwan Scandal. The crown Prince Lee Young happen to be the troublemaker in the palace and he is one of his kind of troublemaker we will surely enjoy. He tried to disguise his father along with the teacher that he is studying hard. But unfortunately the wind blow and few papers flew with it and happen to be caught by Kim Ui Gyo and Kim Gyun Gyo who happen to be with the king. The paper revealed the studying so hard was just a show Crown Prince put on. It become hilarious afterwards when Crown prince tried to stand up his cap falls and it was revealed he wasn't even properly dressed. Jung was the second person who receives dating counseling from Hong Sam Nom and request her to write love letter on his behalf. The crown prince happen to caught the love letter for Princess Myunguen and ask the curt lady not to let her know about it. He will take care of things. 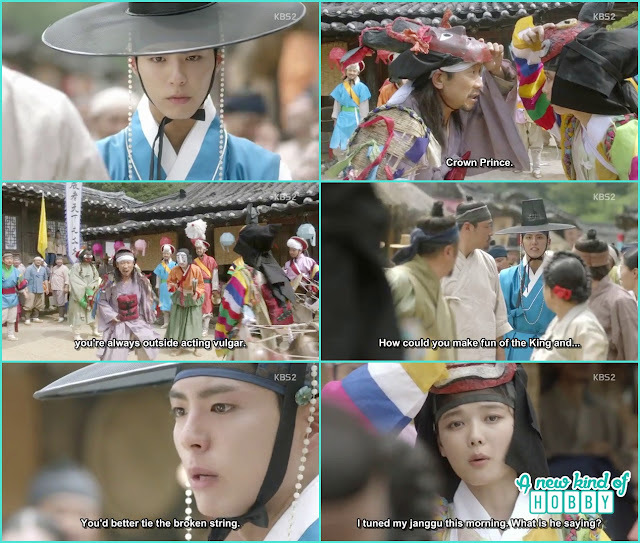 We wonder it might the first encounter with Crown prince with Hong Ra On. He manage to escape from the palace and came to the town. There was a comedy show by Janggu Players who were imitating the King and the crown prince. Every body including us were enjoying this remind us of another historical Movie of Lee Jun Ki "The King & I". Crown prince watching the comedy by Janggu players got annoyed and scold them for making fun of the king and crown prince. It was their first encounter. As the story moves forward Jung already set the place to meet up but couldn't gather his courage to go by himself. 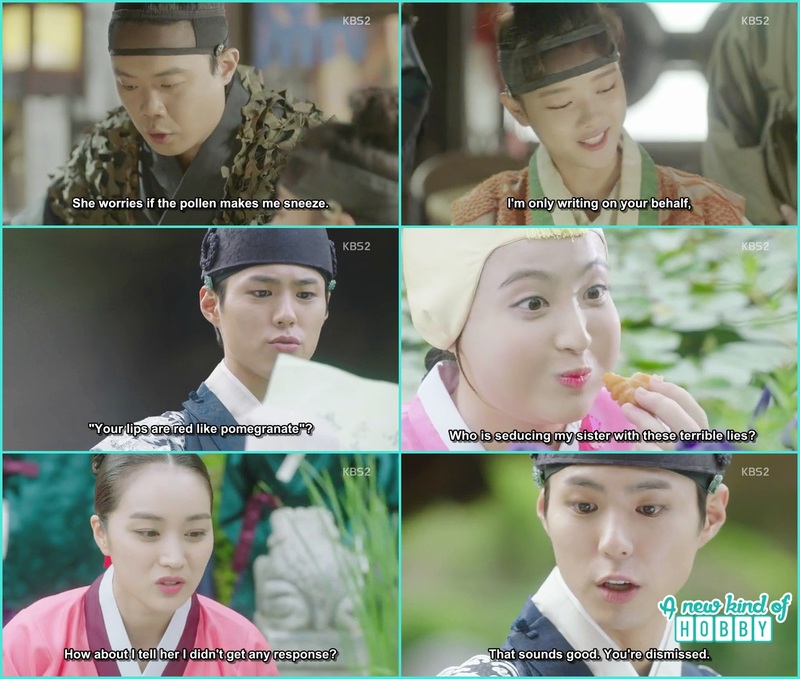 He request Hong Ra On to go there on his behalf, she refused but as she saw money she agreed to do so. Her reasons for agreeing was to pay of her father debt quickly. She was surprised to knew that the love letter Jung wrote not for beautiful women but for a man. Things happen to turn out like this. Ra On take crown prince to eat Gukbap at a famous palace. She also tells this place owns by the former court lady at royal kitchen. Crown prince was irritated with the nagging of the grandmother while Ra On was enjoying and laughing. He found it strange but for Ra On she says its not nagging its a way of love of the grand mother for their children and remind us of my grandmother. Crown Prince insisted Ra on to tell him the truth and lead him the way where she belongs which nobel family she is from. Now Ra on was in total trouble. She sensed she will going to be caught but somehow she tried and mislead crown prince by taking him to near mountain. There she cleverly kick crown prince and made him fall in the ditch. Unfortunately Crown prince alone didn't fall he grab Ra On legs and both were now in a pathetic situation. Crown prince tried to strangle Ra On's neck and in anger who really he is. Why did he made him fall. At the moment we thought its over for Ra On but luckily the snake pooped up and save Ra On. This scene reminds us of an historical drama "Godesses of Fire" where the crown prince along with the girl fell in the ditch and no body was there to help them out for a long time. The crown prince and Ra On argued then settled who will be going to out first. Crown prince ask Ra On to bend down on knees and help him to climb up but as she was too skinny it didn't help. Now it was Crown prince turn to help Ra On climb up. He has a nature to keep a gurage for a long time. Ra on come to listen to his whispering that she will regrets afterwards. She was too clever to caught on situations she didn't show any of the expressions when received help by the crown prince she climbed up and said i will send someone to help you. But it was just the simple wording, she didn't mean it she left crown prince alone. As coming back from the forest she saw a wanted poster of her along with the first person who received counseling from him. The soldiers were on search what to do now she just pick some ink and made a mole near her nose just to make a disguise. It was a bad day for her. Yoon Sung who was watching caught her and made the solider notice her being suspicious but the very second moment he helped her out of the situation . This second male lead seems quite interesting for the story in further episodes. Ra On was in debt she thank him for saving her and left but the bad time didn't end the loan shark men kidnapped her and sold her. She shouted and tried to run away but of no use. Finally she end up at a place where the young boys were made into eunch. She was really scared as well we, we hope she could run away and also thought some one might came to help her out. She used her little brain and manage to disguise disguise the man by making him drunk. Bravo we were too happy for her. She saved herself from being exposed. After that she was sent into the palace to become royal Eunch. There she had to pass three exams to be in failing one she will be kick out of the palace. She was all scared how to pass or to fail the exams. So she decided to run away. Bad time was around her and she was caught by the crown prince. It was another hilarious scene we really enjoyed and believe the title is right Love in the moonlight. Crown prince recognize her so did she. Crown prince remember what she said before leaving and wanted to take revenge on her "It's nice to see you Puppy" with the evil smile that he is up to something which will not be good and not in favor of Ra On. The episode ends here. We really enjoyed watching the first episode. Not a single moment we feel bore or out of line for the theme and story except we didn't like politics so that part we just simply passed on. What's eunch and how they become like this it was our first time knowing about this. We hope the drama would be light and funny with the interesting story turn up tiwist in rest of the episodes. Usually historical dramas turn into bloody, conspiracy and fight full. The expression through out the episode were too good. Its all for now let's hang on and watch out episode 2.